On our second (full) day, we packed a small suitcase and were ushered out of the hotel by 8. The small van picked up three other groups of passengers, two couples and a family of three. Relaxed and excited, everyone greeted every addition with a cheerful “Good Morning!” On our 3 hour ride, we learnt that there are six bridges spanning Hanoi, designed and constructed by French architects. We also learnt that our tour guide has two daughters, both in elementary school, and that his wife was in the hospital. Like how Hanoi wears its history proudly, its people love sharing their stories. We exchanged the motorcycle-crowded streets of the city for long stretches of bumpy country road. 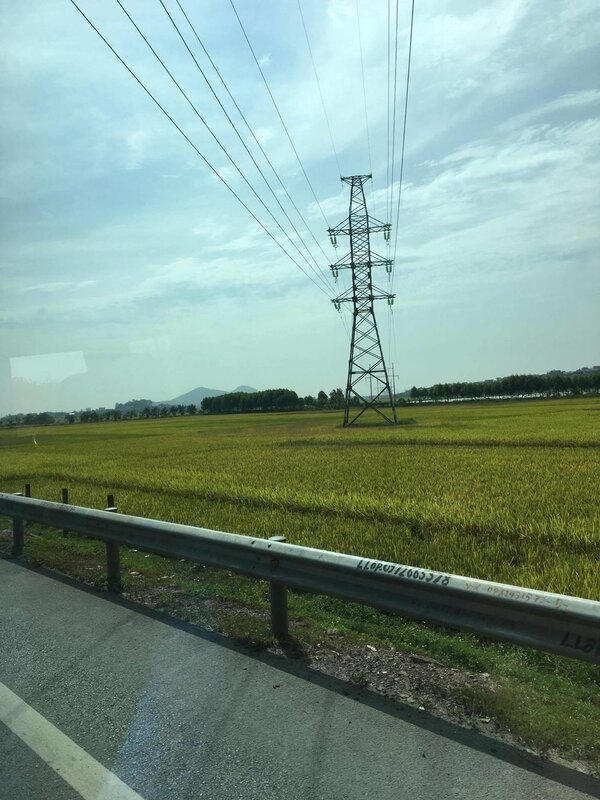 Lining the highway were two-storeyed houses, built thin in width but extending deep into the fields that stretched out, out, out. Tuan Chau Halong Bay Marina is expansive, with a narrow driving strip that connects it to the main land. The greens and browns give way to oyster farms in shallow water, sun glinting on calm waters. By the time we arrived, the temperature had risen to mid-30s degrees, the dry heat only slightly alleviated by a balmy coastal breeze. Our cruise company, Aclass Cruises, has three cruise ships of differing sizes and class: the Carina Cruise, Aclass Legend and Stellar Cruise. The ships were beautiful woodcraft that belonged to leather bound journals, whitewashed planking giving the otherwise new mahogany base an olden feel. We boarded the Carina; it has two levels of living quarters, and a sun deck with in-laid fake grass. I begged off the panoramic view for a tourist-observation session, lonesome me taking in all our sweaty glory, shirts stained with sweat and faces grimy. Hanoi tourism is very in-your-face; groups get taken to the same spots in a mass-produced set up, evidenced not only by the halfway stops we do on our drive out of city, but “attraction islands” like this, where we alight small boats by small boats, sun glasses and straw hats alike. Some faces I recognize from other tour groups I’ve seen at previous attraction points. Still, surrounded with heat-bleached rock formations and under a glazed blue hazy with summer humidity- for this I've been waiting for a long time. A full fledged scenery is no more beautiful than being at sea level, under the close cropped rocks and uninvited cigarette smoke of ageing uncles, unknown music from an old stereo. We had to wear life vests when we were on the bamboo boats, "Leave your worries behind" printed on the back in fine white. "They're still there when we go back though," I said to my mom. "Too bad it's not a solution," she laughed, "We can walk away! But worries are still waiting." Sunset is gorgeous. The rock formations break the red glow in layers, and the orange of the sun condenses into a burning centre, the spread wavering at the edges. The spots of clouds complete the picture into something unreal. Green growth fades into incomprehensible black, by nightfall, the blocks will become indistinguishable. On the other side of the boat where the red cannot reach, the blue gives way to grey at a slower rate. The sun decks of our neighbouring boats are getting clearer in pinpricks of light and strains of music. The waters were very calm at night but the wind seeped through the broken window's gap in a whooshing echo. I slept on the narrow add-on bed, mattress dipped in the middle, listening to the sleep heavy inhale exhale of my parents. Between the queen sized bed and window, I could barely move, only enough to turn on my side and then back and then side and then back. Thuds sounded occasionally from the crew turning in for the night, and I remember falling in and out of sleep, interspersed with my usual turbulent dreams, until my mom got up and light broke into the room at five-thirty in the morning. I lay there drifting until my alarm rang an hour later. 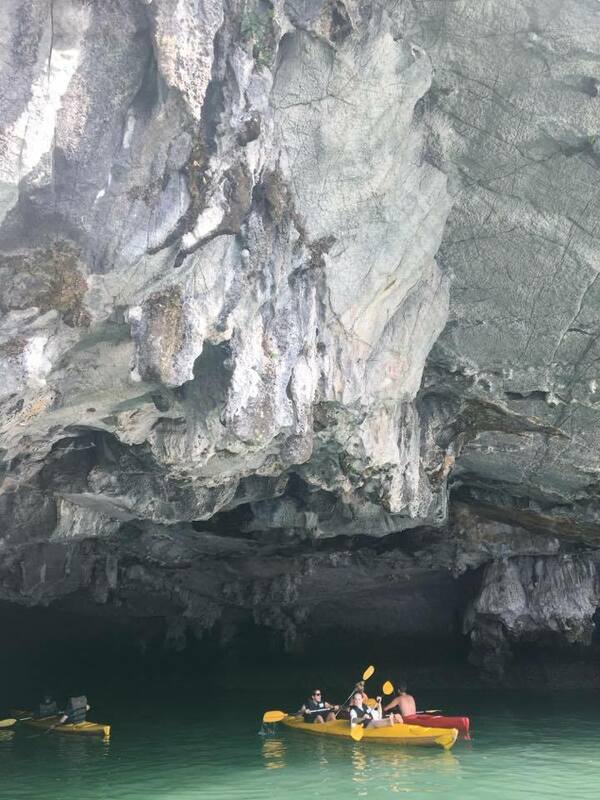 The tour guide brought us to Surprise Island, named after the surprising silhouettes of its limestone caves. Set in a jutting island, we spot other tourists up at the lookout spot even as our small day boat slowed to a crawl. The stairs up to the mouth of the cave wasn’t very many, but there were countless of legs in view. Our view of the bay emerged wider and brighter every level up, and the boats never stopped ferrying back and forth. We stopped at an alcove for a short history lesson. Halong Bay - "Ha" pronounced with a downward inflection to mean "descent" and "long" tracing back to our shared Chinese history to mean "dragon" – tells a legend of early Vietnamese people calling down the dragon lords against the Chinese invaders, the various islands created when the dragons descended and spit out pearls. Other versions involve the French, where Halong Bay was initially penned "snake bay" due to the rise and dips of various islands like a sinuous back, but later renamed by the locals "dragon bay" for a more holy name. We then went further in, caves opening up to curved pock marks in the ceiling, dripping limestone and layered ground which often gave way to holes leading miles deep. Limestone and coral formations were imagined as a turtle, elephant, even Santa Claus' head. With the cast of yellowish light from installed steps and lighting, it was like another world. Our cruise finished with a live demonstration/tutorial of how to make spring rolls: mix shredded carrot, mushrooms, spring onions, onion, pork, fan see, egg, then use the egg whites to soften the rice paper sheets. Arrange a tablespoon of the mixed up ingredients on one end, fold up the two sides and roll it up until sealed. And that's lunch! We all passed out on the trip back into Hanoi. The bus dropped us off at our hotel sometime late afternoon. With only fifteen minutes to spare, we made our way to the next item on our itinerary: the Water Puppet Show. Unsurprisingly, the theatre was filled with tourists. The theatre wasn’t too big and its square structure ushered us into packed rows of bobbing heads. The stage was divided into two side sections where the orchestral crew and voice actors sat on an alleviated platform on the left, and the right wing held space for additional puppeteers. The main part of the stage was a filled water tank, backdrop coming down in a curtain, where the puppets emerged out from. The show was an interesting mesh of storylines. While I appreciated the obvious effort and preparation put into it, the lack of English translation meant I couldn’t fully understand what was happening. There was this rather bizarre scene of dunking babies… but otherwise the effects were pretty cool, especially this one part that brought out these sparklers and smokescreens. The show is a good introduction to Vietnam’s traditional art forms, so if you’re interested in how story telling manifests in different cultures, the puppet show is probably something you want to check out! We later had dinner with a friend from my university days. She brought us to this restaurant that caters various dishes from across Vietnam, and we ate so much! Every dish was a delight - I only wish I recorded down all the names of what we ate. I especially loved the rice pudding with pork floss on it, as well as the wraps! To round off this long, exhausting, pretty awesome day, we took a stroll around the lake where roads are blocked off for the weekend, just taking in the street side entertainment. If you're all for night life that isn't bars and clubs, definitely join in on this crowd!